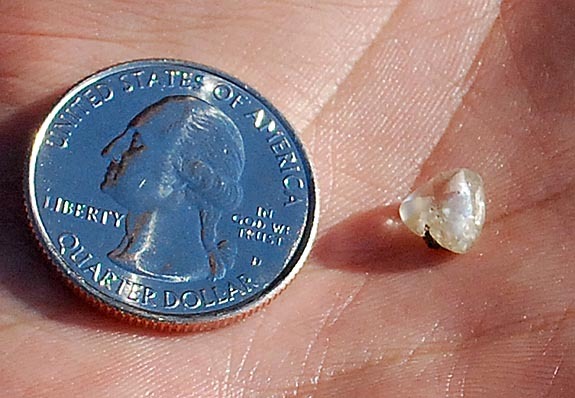 First-time prospectors Dan Frederick and his daughter, Lauren, scored a 2.03-carat white diamond within 60 minutes of searching the side of a plowed furrow at Arkansas’s Crater of Diamonds State Park last Tuesday. Dan Frederick, who hails from Renton, Wash., and Lauren, who lives in Los Angeles, traveled 2,200 and 1,600 miles, respectively, to prospect for gems together at the only diamond site in the world that allows treasure hunters to keep whatever they find. The entry fee cost them $8 apiece. The Fredericks had never visited the Crater of Diamonds State Park before and planned their trip to Arkansas after searching the internet for "places to find gems." 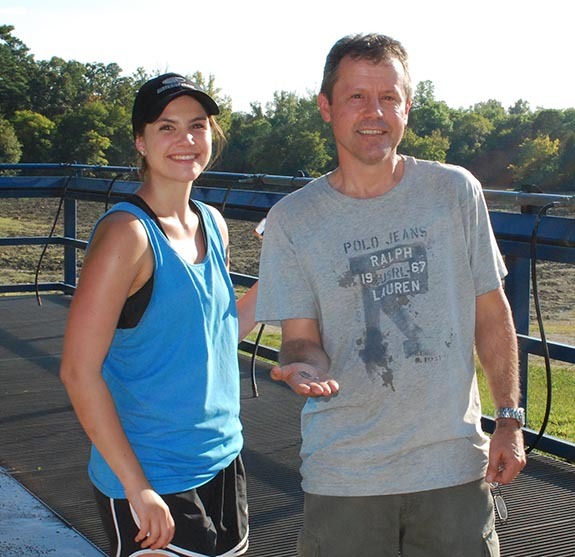 Dan Frederick noted that he and his daughter started their search for gems at 8 a.m., and by 9 a.m. Dan had spotted the diamond's metallic shine on top of the ground near the Star of Arkansas diamond marker on the north end of the park’s 37.5-acre diamond search area. The Fredericks named their find "The Lucky Diamond." 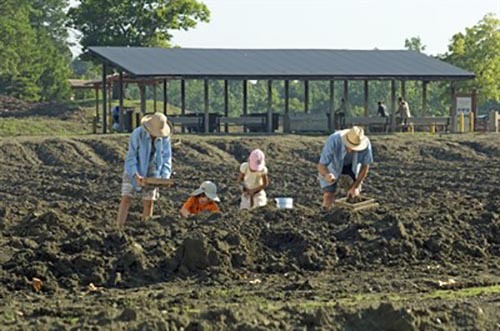 Lauren Frederick told ArkansasOnline.com that the diamond "was the cherry on top of a fun and special trip." "Finding the diamond will be one of my favorite memories, especially since my dad and I found it together," she said. 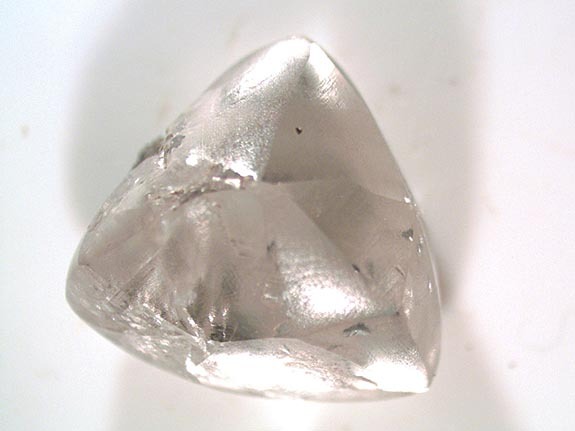 Park Interpreter Betty Coors described the diamond as having a pearly white color and a distinct triangular shape that results when two diamond crystals share part of the same structure during formation deep within the earth. These twinned crystals are called "macle" gems. Larger diamonds are occasionally found on the surface of the search area by park visitors. Diamonds are a bit heavy for their size, and when rain washes dirt away, they are sometimes exposed right at the top. When the sun comes out, they sparkle and are easier to spot. The Fredericks have yet to decide whether they will have their diamond faceted and polished or leave it in its natural state. The search field in Murfreesboro, Ark., is actually the eroded surface of an ancient diamond-bearing kimberlite pipe. The park maintains a generous finder’s keepers policy and even provides experts to help amateur prospectors identify what they’ve found. Besides diamonds, the search field often yields amethyst, garnet, peridot, jasper, agate, calcite, barite and quartz. The excitement of finding a precious gemstone has made Arkansas’s Crater of Diamonds State Park a popular family-fun attraction. In 2015, the park welcomed 168,000 visitors, compared to 51,000 just 10 years earlier. Credits: Images courtesy of Crater of Diamonds State Park.